This is an economical PVC hose commonly seen in various commercial, agricultural, hydroponic, golf course, and municipal watering applications (NOT for use with air and not for food grade applications). Unlike other economical PVC water hoses on the market and found in department stores, our NL2406 is manufactured with virgin materials, thereby allowing it to remain flexible and it will not harden or crack. 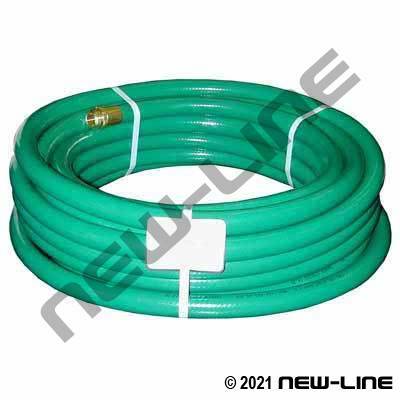 It is a non-marking, lightweight hose that can be used for nursery supply lines, lawn watering, or light duty washdown. It has good resistance to weathering, aging, and ozone. Private branding is available with 15,000' run requirements and a one time setup charge. Typical Fittings: Brass or nylon garden hose fittings, brass FBL ferrules, pinch clamps, gear clamps. Construction: Tube: Smooth, black PVC. Cover: Smooth, yellow or green PVC. Reinforcement: Spiraled synthetic yarn.